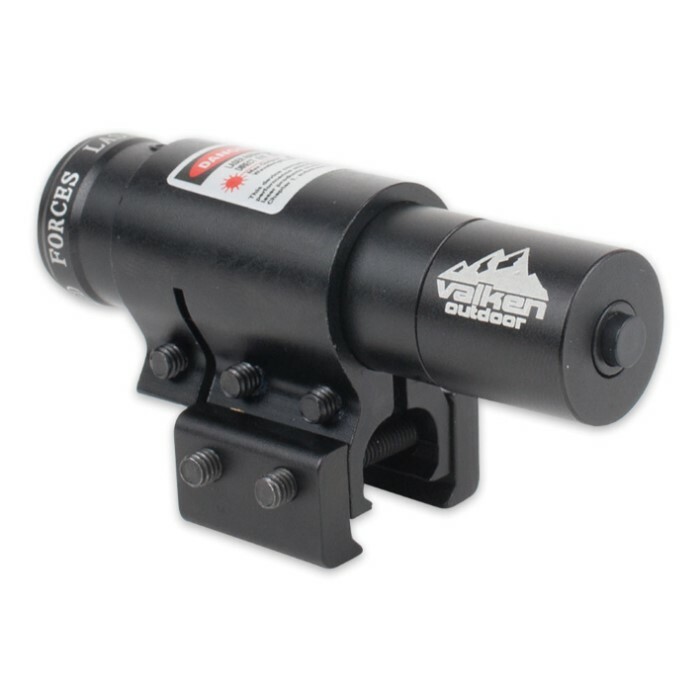 Valken Universal Gun Laser Sight with Picatinny / Weaver / Dovetail Mounts | BUDK.com - Knives & Swords At The Lowest Prices! 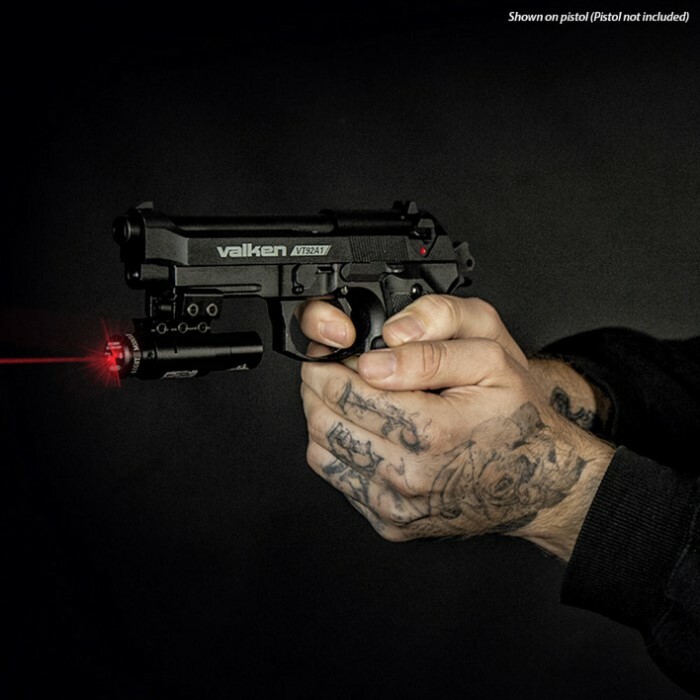 Precise and easy to use, Valken's V Tactical Laser Sight turns even novice shooters into expert marksmen! Its powerful red laser pinpoints the precise position your shot will land, yielding flawless accuracy with every pull of the trigger. There's no lining up notches or beads, squinting through narrow apertures or other slow, meticulous aiming techniques. The V Tactical Laser Sight aims at the speed of light - literally - making it perfect for fast-paced tactical shooting, lively airsoft and paintball gaming, and other activities that require quick target acquisition. And solid, all-metal construction ensures it stands up to years of even the most vigorous, action-packed shooting. 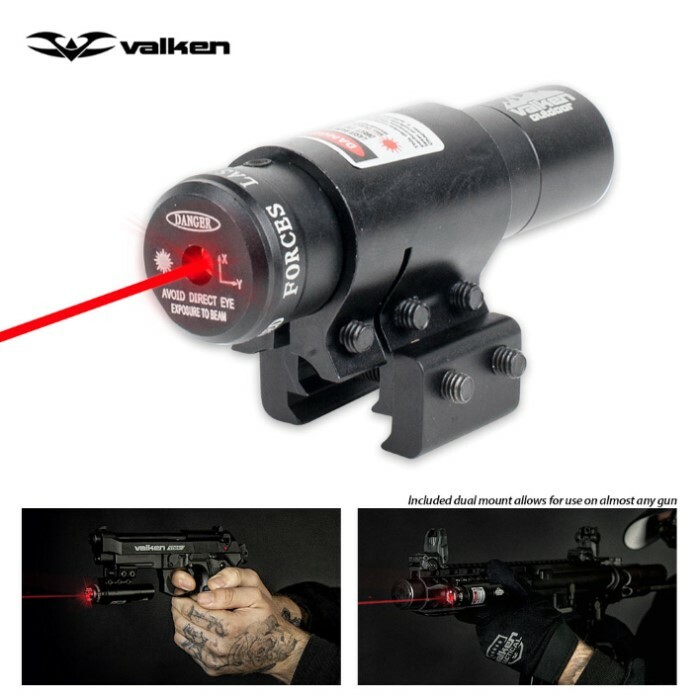 Generated by a powerful, high efficiency laser diode, the sight's intense red laser beam is visible up to 300 yards at night and 20 yards during daylight hours. Use it for short-range hunting and down game with a single shot - no accidental wounding or gut shots! Windage and elevation adjustments let you fine-tune your aim in irregular shooting conditions, compensating for wind and other trajectory-affecting environmental variables. Extraordinarily versatile, the V Tactical Laser Sight mounts to Picatinny, Weaver or dovetail rails and is designed for a variety of weapons and applications - pistols, rifles, tactical, airsoft, paintball and more. So take the guesswork out of aiming, no matter your weapon of choice - add this invaluable accessory to your favorite gun, and shoot with confidence round after round.